We continue our preparation for our magical trip to Disney World in October. 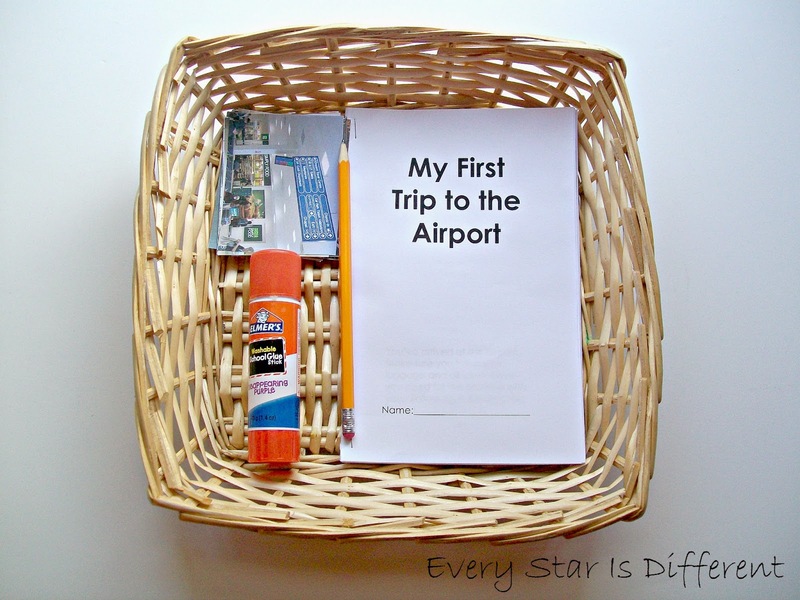 Now that we've learned all about the airplane, it's time to prepare the kiddos for their first airport experience. This unit is a bit different than units past. You won't see the typical language, math, science, and geography activities. I wanted to really prepare the kiddos for this experience which meant a lot of hands-on practice. It's been so much fun to watch them learn. Hopefully they'll enjoy the airport as much as I do. Did I mention how much I LOVE airports and flying? I'm THRILLED to share this new experience with my kiddos. Before they came along, I flew at least 4 times a year. The last time I flew, Dinomite was an infant. (He's 8 years old now.) It's been way too long. I'm not sure if I've shared this before, but Dinomite suffers from Neophobia-the fear of new things, experiences, etc. This part of his autism is by far the hardest for me to manage. It affects EVERYTHING that we do as a family, from what I serve at the dinner table, to a day out of the house. One would think this would get better over time, but it hasn't, and so we continue to teach him how to cope in the best ways we can. One way I've found to help him is to create stories with pictures in preparation for big events. In the special education world, these are called social stories, but quite honestly, they're not just for special needs kiddos. Every child would benefit from this type of preparation. My hope is that if I create a social story for each part or day of our trip, it will help him be ready for our new big adventures with minimal meltdowns. He thoroughly enjoyed the social story I made in preparation for the airplane ride itself. If you haven't checked it out, be sure to visit my airplane unit for the free printable. So far my plan seems to be working as Dinomite's anxieties about the trip are lessening. Granted we aren't at the airport or on a plane yet, but when we first scheduled this trip he was spending at least one day a week melting down, completely anxious about the unknown. I haven't seen that in a couple of weeks, right about the same time we started this process. Instead of melting down, he's taking what he's learned and running with it, identifying movies that include specific things he's learned, researching airplanes, and so much more. I just love his smiles! This week we introduce our airport social story. I kid you not, I spent at least four hours on the phone with our airline asking questions to make sure I had every detail correct in our book. It shouldn't surprise me anymore, but I still am shocked at just how many steps and details there are in some processes, especially a trip to the airport. It's no wonder kiddos with anxieties, autism, and other special needs struggle so much as they attempt to be successful at things we take for granted. Their poor little brains are on complete overload! Hopefully this book will help. Our trip is 5 months out. I'm starting a folder for each of the kiddos with all of their social stories and other preparation items to review with them often. It may seem silly, but they will need it. This book starts out as you enter the doors of the airport and takes you through every process you may encounter until you board your airplane. It also addresses layovers and baggage claim. I worked hard to make sure new terms were defined. 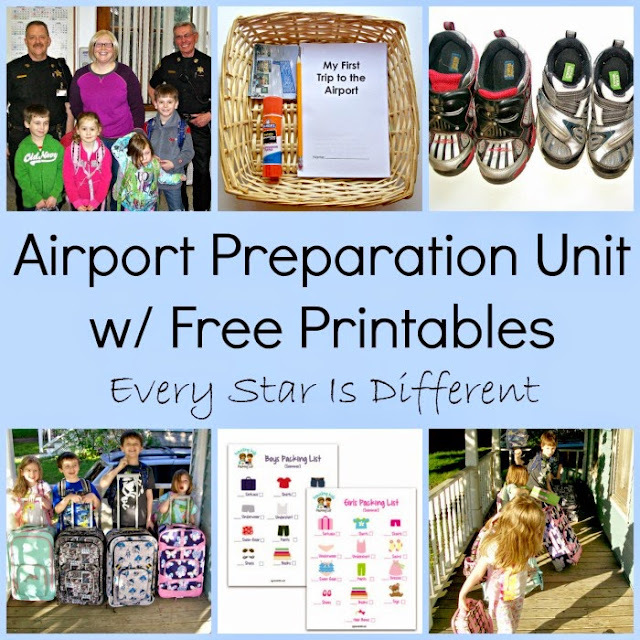 At the same time, I tried to include airport vocabulary so the kiddos would be prepared for words they might hear or read. It was very difficult to minimize the amount of words used to describe each step. 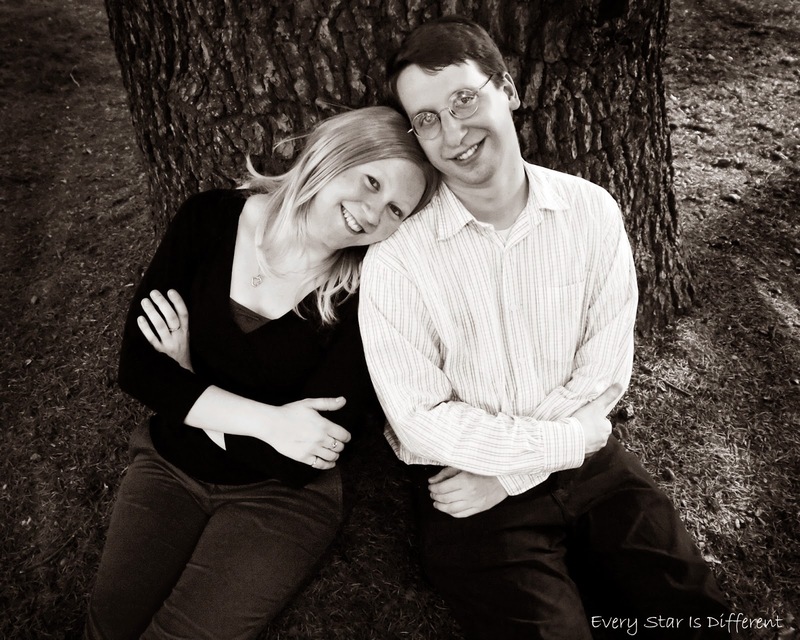 Both my husband and I worked very hard to make the book as simple as possible. It took a while. 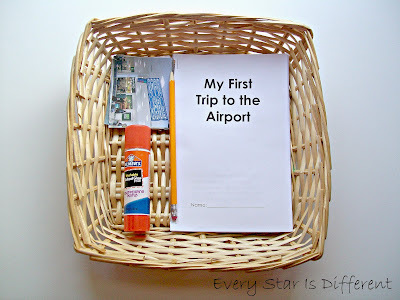 For each page of the book, the kiddos will glue a picture that matches the description. The pictures are actual pictures from airports to help them learn what they look like etc. Each picture is numbered to match the page number it belongs on. When you print out this book, or even view the printable, the page numbers will be mixed up. I created the book in Microsoft Publisher, which aligns the pages as if you were going to fold the pages and put the book together. All you need to do after printing is fold the pages in half, cut on the fold, put story book pages in order, and then cut out pictures to glue on them. Hopefully this makes sense. Okay, so... I was NOT planning on having my picture taken while on our field trip. My husband finagled his way out of the picture WITH the camera, and voila. Here you see me with a baggy sweatshirt sweater, no contacts, and no make up. Yup! This is me at a not so flattering angle. Oh well. One of my biggest worries about our upcoming airport experience is going through security. 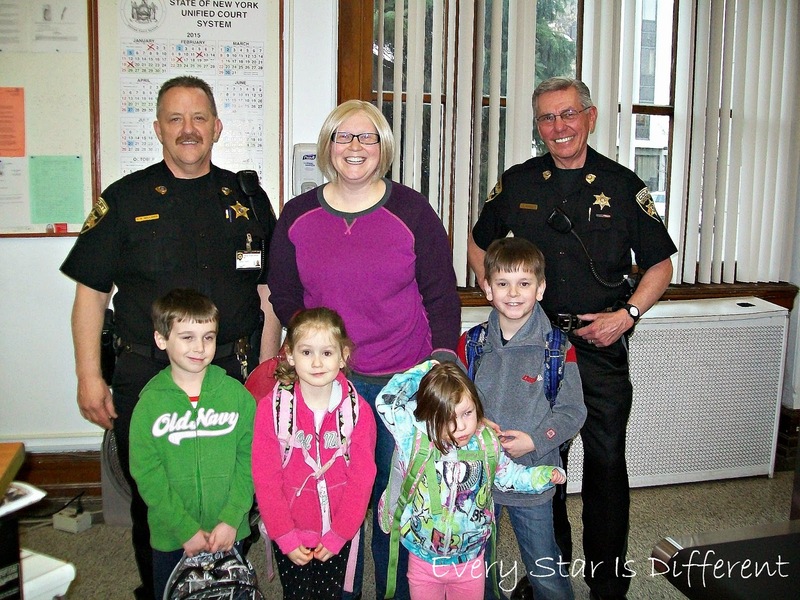 It's a bear to begin with, but with four special needs kiddos... Shoot me now! Then one day the idea came to me. 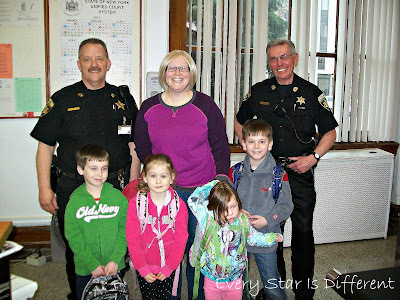 What if we visited our local court house? They have an x-ray machine. There's a metal detector and they even use wands just like at the airport. I stopped by one day to ask if it was okay to bring the kiddos. They looked at their schedule and told us when to come. It was THE BEST field trip ever! The security guards were amazing with the kiddos. 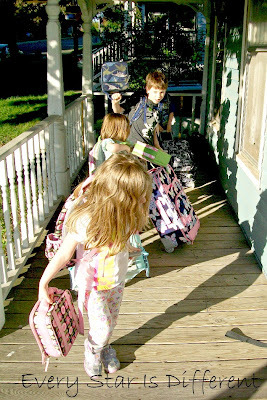 In preparation for the experience, each kiddo brought a backpack full of their favorite things from their rooms. When we arrived at the court house the guards asked for the bags. At this point we hadn't explained this process. Bulldozer immediately ran past the metal detector to get his bag back. He didn't understand why the guards were taking it. This was when the teaching came in. Again, the guards were great. Going through the metal detector was hilarious. None of them knew what they were doing and so confused. Once we were all past security, the guards explained each step of the process the kiddos had just gone through. Jason went through the detector again with a belt to show what would happen if someone was wearing metal. The security guards brought out their wands and demonstrated on Jason what would happen if they beeped going through the metal detector. I LOVE how the kiddos were able to see and hear what each step looked and sounded like. Once Jason's further screening was finished, the security guard found metal on each of the kiddos sweatshirts (while the kiddos were wearing them), and used the wand to make them beep. They all laughed. Finally the kids were brought behind the security desk to get first hand experience with the x-ray machine. Dinomite asked a ton of questions. All the kiddos LOVED seeing the contents of their bags on the screen. It really was such a neat experience for them. I do believe they're much better prepared now. The last part of the security screening I wanted the kiddos to be ready for was removing and putting their shoes back on. Dinomite is proficient at this but Bulldozer and Princess can always use extra practice. 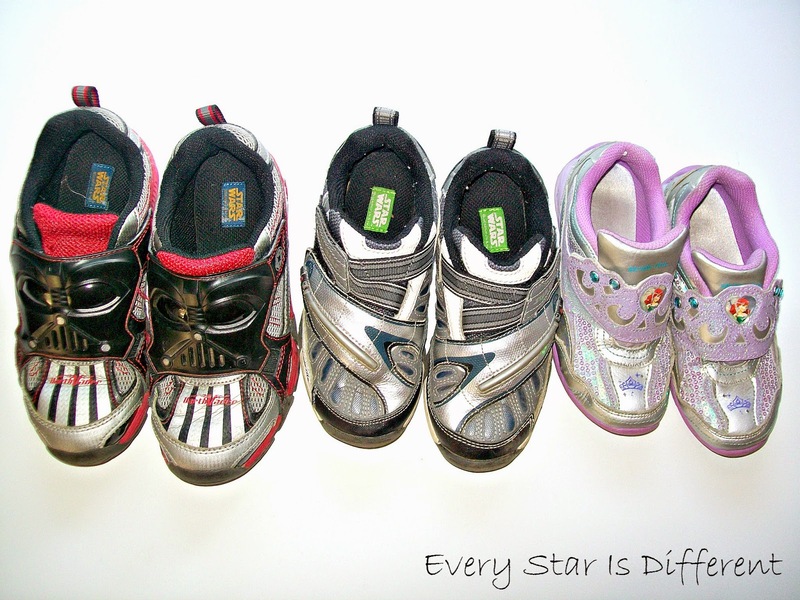 When it comes to removing shoes, it's not that they can't, it's that they love flinging them off, causing the shoes to go flying. That's not quite what I want to have happen at the security check point. As far as putting them on, the speed can always be improved on. 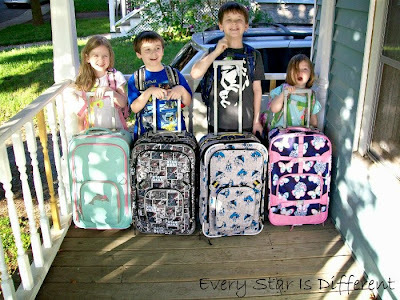 The kiddos have had their own backpacks and lunch boxes for a while, but the luggage is new. The last time I traveled by plane, I only had Dinomite, so my personal luggage worked. But now with four kiddos, one suit case just doesn't cut it. We let the kiddos pick out their own luggage, and made sure the bags were small enough to work as carry-on if we wanted to use them as such. The luggage arrived just in time for a practice run, as we're heading to the beautiful 1000 Islands for vacation this coming week. When you have new luggage, it's crucial that you fill it full of things you'll need for your vacation RIGHT AWAY! Or so the kiddos think. Lol. They were lucky we actually are going on vacation this weekend for a week, so it gave them a chance to practice. 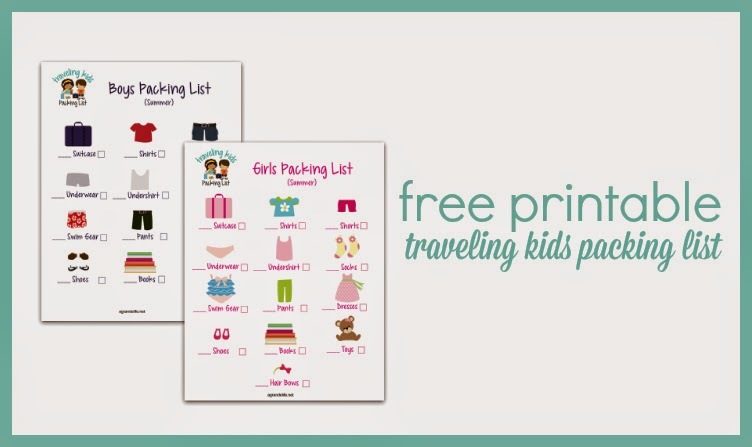 I printed out these adorable FREE packing list printables from A Grand Life. I love the pictures included for those who can't read yet. The kiddos loved that they were able to check the box, once the correct number of each item was packed. My only complaint about the printable is that it doesn't include pajamas, a jacket or sweatshirt. Still, we're using them because they're just so darn cute and perfect for the kiddos! 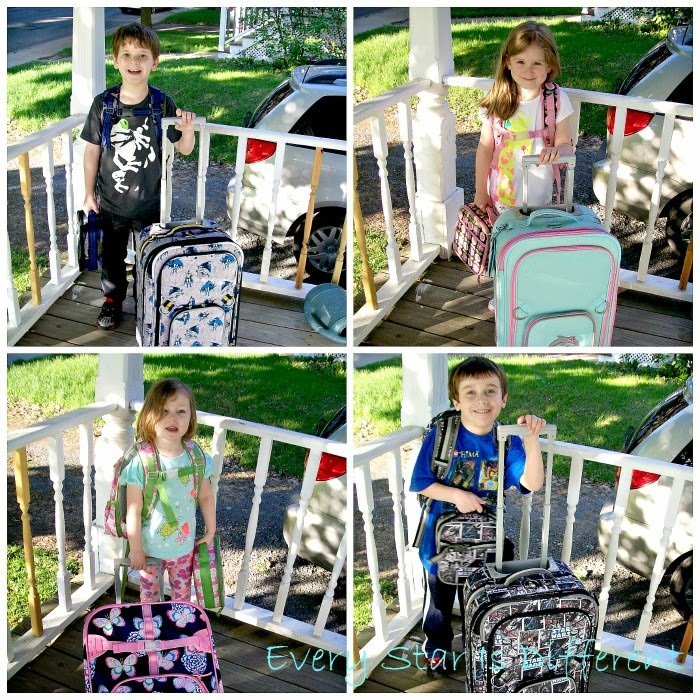 They successfully packed for their upcoming trip with some assistance from Mommy and Daddy. What a relief to have that done! It's one thing to have your own suitcase and to pack your own suitcase, but an entirely different thing to know how to maneuver your suitcase, especially when it's packed full of stuff. Just the weight difference between an empty suitcase versus a full suitcase completely alters one's ability to move it around. It may sound silly, but the kiddos have been practicing pulling their suitcases, while also carrying their lunch boxes and having their backpacks on. And well... they need the practice. Lol. Only two kiddos have dropped suitcases on their toes, which is a good thing, but almost all of the kiddos struggle to turn their suitcases when needed. Two end up actually flipping them over. I'm sure as practice continues the kiddos will become pros and they'll get some great sensory input too. Hopefully we'll be able to provide some extra opportunities for them to use them before our big trip to the airport. 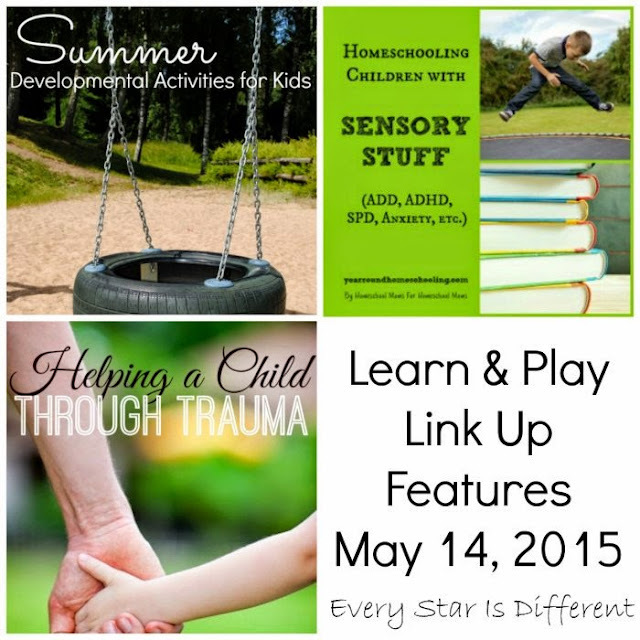 I was super excited to see a few posts linked up last week discussing special needs and couldn't resist featuring them this week! 1. 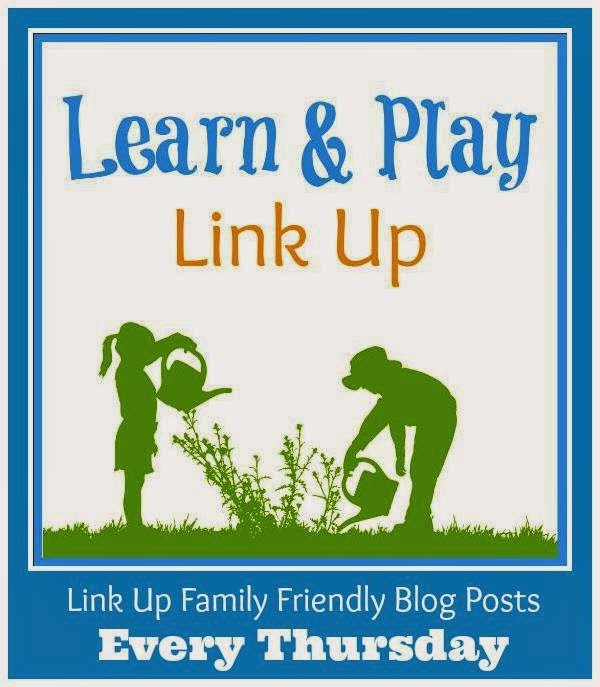 Link up 1-3 posts. 2. Follow each hostess on social media. 5. 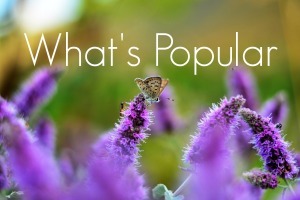 Visit 3 shared posts and leave a comment. I can't wait to read all of your favorite posts! Please accept my invitation to follow Every Star Is Different on Pinterest if you'd like to keep up to date on all of my latest posts. Follow Every Star Is Different's board Every Star Is Different on Pinterest. These are some great ideas! Your field trip to the courthouse reminded me about our upcoming adoption and how beneficial it would be to our kids to have a run-through. When you adopted either of your younger two, did you create a social story about that for the boys? If so, I'd love to see it.